2457 Dundas Street West, Oakville is on Lot 30 Concession 1, NDS Trafalgar Township. The Crown Patent for all 200 acres of Lot 30 was issued to John Shaw in 1808. In 1876, three quarters of an acre in the southeast corner were sold by William Henry Hagar for a school and today, the old S.S. #2 schoolhouse, home of the Trafalgar Township Historical Society still sits beside this old house in Palermo. Today, people know the house and property as the Fox family farm. George Neil Fox and his wife, Beatrice Mabel (McCuen) raised their family in this house from the early 1900s through to the 1970s. The Fox house is on the Palermo Inventory of Heritage Buildings. 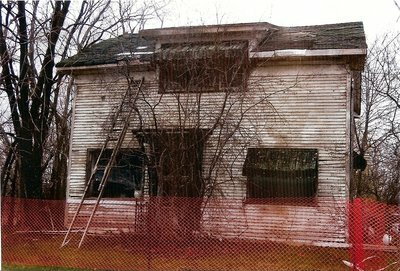 As of March 2019, a heritage assessment of the property is near completion. The Region owns the property. The building will have to be relocated to a nearby accessible lot if the decision is to retain it.